With it being time for Spring cleaning, most of us wish there were ways to get the job done faster! We all want to go out and enjoy the warmer weather, but we want to come back inside to a neat home. 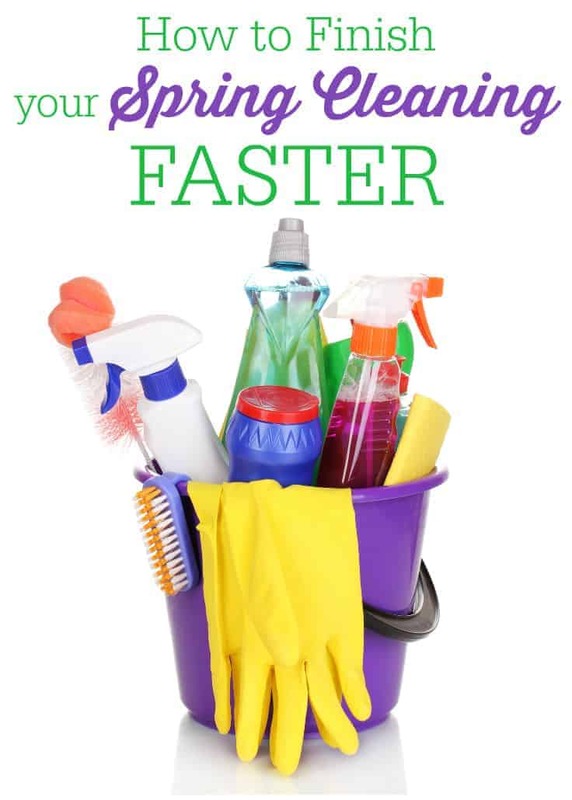 Read on for ways you can finish your Spring cleaning faster, so you aren’t stuck inside all day, every day! 1. Start each room by decluttering. The less ‘stuff’ you have to clean around, the less time it will take! When you start cleaning a room, bring in a couple of bags: one for donate, one for trash. If needed, grab a third bag for things you need to go through later. Don’t let yourself get consumed with papers and books when you need to be cleaning the rest of the room. 2. Carry cleaning supplies with you. Having a bucket full of your cleaning products is a great idea if you want to minimize your spring cleaning time. Make sure your bucket has gloves, assorted cleaners for different materials, and air freshener to leave the room smelling fresh once you’re done. Tip: You may want to create a bathroom cleaning kit, and keep it under the sink or in the closet. Since this room needs special cleaning items (toilet brush, shower and tub cleaner, etc), having this kit on hand will reduce your cleaning time throughout the year! 3. Pace yourself. You may feel like you need to get through your entire Spring cleaning to-do list in one day to be fast. However, this usually results in poor tidying, and increases the chances that you’ll need to clean again. Instead, limit yourself to a certain time for cleaning each day. Spreading it out lets you take breaks, recharging yourself for faster cleaning. Also, you won’t get too overwhelmed with all that needs to be done. 4. Work from top to bottom. Cleaning from the ceiling to the floor keeps you from having to do the same tasks over and over. Always dust first, and start with the fans, shelving, and photos on the wall. Bring all the dirt down to the floor before your vacuum. 5. Finish one room before starting another. You may feel the need to work on several rooms at once, but this can be less time efficient. It may also discourage you from finishing your Spring cleaning as you may not notice much is done with all your energy spread in multiple places. The only time you should work on multiple rooms is when you are sweeping, mopping, or vacuuming. You can do these tasks in bulk for a faster finish to your spring cleaning! For more cleaning tips, check out my posts about How to Keep Your Toilet Clean All Week Long, 4 Ways to Make Your Home Smell Amazing, Daily Cleaning Checklist, How to Clean Your Home in 15 Minutes and How to Clean Your Microwave Without Scrubbing or Chemicals. How long does it normally take you to finish your Spring cleaning? Pace myself. I sure did. I also started early so I could really take my time and be effecient. Just need to finish the windows…. All great tips. Usually it take me about 4-5 days to do the Spring Cleaning. I’m still stuck on the declutter phase … I swear, I cannot get rid of our extra stuff. Thanks for the tips. I definitely needed some help, I’ve got a lot of cleaning to do. Great tips. I don’t like cleaning, but I like the results. Great tips, because with warm weather coming, I sure want to go enjoy it. Thanks. These are great tips, it usually takes a couple of weeks for us to complete our spring cleaning, we take our time. I especially like your tip to Pace Yourself when spring cleaning. Each day that I clean, I tackle something that is bothering me. For example, this week I finally wiped down our interior white panel doors that catch dirt along the edges. Spring cleaning takes me a really long time. I’m not very efficient. Thanks for your tips. I’m sure they’ll help me out this year. Great tips, thank you! Pacing yourself is the best thing you can do to not get overwhelmed! Great tips! I’m terrible for hovering and then wiping down surfaces – and having to hoover all over again!! I also get easily distracted so find myself running between rooms and never actually finishing one! I’m keeping #’s 4 & 5 ingrained in my brain this time!! Thank you for sharing these great tips! This will make the job much easier! Thanks for all the great tips. Now, if I could get enough energy to get started! Thank you! Such useful tips…thank you for them! These are some great tips! IT def can be quite daunting when you have alot to clean or organize. Ive been putting mine off for a while. These are some lovely tips! I am preparing to do a fall deep cleaning of the house and I need somebody or something to inspire me, because I really don’t feel like doing it! I deep clan my house every year before winter comes, because in the winter it’s cold and dark and I don’t like moving furniture and cleaning windows! Thanks for sharing these nice ideas! I will definitely use them! 🙂 Greets!